The Treasury of the Principality of Sealand, the world’s oldest man-made micro-nation and self-proclaimed independent state located in the North Sea have announced that a Sealand commemorative coin has been issued in celebration of the 50th anniversary of the declaration of independence which occurred on the 2nd September 1967. On that day 50 years ago, four members of the Bates family, along with friends and supporters, raised the principality’s newly designed flag on the tower for the first time. Accompanied by his wife Joan, his 14-year-old son Michael and 16-year-old son daughter Penelope, Roy Bates declared the Principality of Sealand an independent entity, claiming “Jus Gentium” or “Law of Nations” over a part of the globe that was “Terra Nullius” or “Nobody’s Land”. Joan Bates herself became the territory’s co-ruler as Sovereign Princess – on her 38th birthday. This is the second authorized Sealand commemorative coin since 2012, and it is designed by Michael Alexander. It is struck to proof quality by the Tower Mint, UK on behalf of the Treasury of the Principality of Sealand. The reverse side of the coin depicts the very moment when Sealand’s flag was raised for the very first time and is based on a photograph taken just after the flag was raised by Princess Joan. The commemorative text “RAISING THE FLAG, 2nd SEPTEMBER 1967” is placed just under the image along the lower edge. The text “PRINCIPALITY OF SEALAND” and the coin’s denomination of “25 DOLLARS” and “2017” are placed above the central design arranged in three lines. Michael Alexander’s initials “MAA” appear to the right of the primary design. The obverse side includes three detailed portraits of all three sovereign Princes and Princesses since independence was declared in 1967. The top effigy is that of Sovereign Prince Roy, who ruled from 1967 until his passing in 2012. The second effigy is that of Sovereign Princess Joan who was co-ruler from 1967 until her passing in 2016. The third effigy is that of Sovereign Prince Michael who succeeded his father in October 2012 and subsequently his mother in March 2016. Prince Michael is Sealand’s sole ruler and this is the first coin issued by the Treasury of Sealand to include his effigy. All three effigies are based on official photographs taken for the occasion of the 35th anniversary of Sealand’s independence in 2002. Sealand’s official motto “E MARE LIBERTAS” (Latin for “From the Sea, Freedom”) is placed above the portraits with the commemorative text “50th ANNIVERSARY OF INDEPENDENCE” positioned below the portraits in four lines. Michael Alexander’s initials “MAA” appear to the right of the portraits. 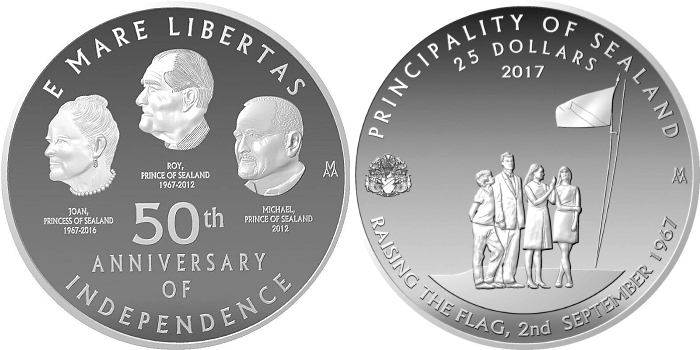 The coin was authorized on September 2, the 50th anniversary of Sealand’s declaration of independence, and went into production on December 5, 2017. The coin is encapsulated and presented in a custom gold-colored leatherette case imprinted with the Principality’s commemorative dates and crest on the top cover. As with the previous 2012-dated crown, the anniversary coin is individually numbered from 001 to 300 and hallmarked, which is applied on a smooth portion of the coin’s reeded edge utilizing laser technology. A numbered certificate of authenticity corresponding to the coin’s actual number will be included. The coin is retailed directly by Sealand’s treasury and orders can now be placed with immediate dispatch and delivery. For more information on the 50th anniversary of Independence coin, please visit their e-webshop on the Treasury’s official website, Principality of Sealand at www.sealandgov.org/shop/stamps-coins/50th-commemorative-coin. Article courtesy of Michael Alexander.